What are some causes of excess crankcase pressure, and what can I do to correct it? I have a newly built motor, that blows the dipstick out at about 6000 RPM. Here's the basic info - its an .030 small block 350 with Eagle stroker crank. (=383ci) speed-pro hyper pistons, flat top 2VR, Mahle moly rings. M55HV oil pump & Moroso pickup, 6 qt pan. 64cc Sportsman 2 angle plug heads, Elgin flat tappet Hyd. cam, 292 int, 300 ex, .488 lift with 1.6 roller rockers, .041 felpro head gaskets. Torker 2 intake, 600 edelbrock carb, HEI dizzy. CR should only be around 10.5:1, running 93 octane pump gas. Oil pressure is 80psi cold, about 50psi once its warmed up. I put a differential pressure gauge on the dipstick, and its reading 1.5 to 2 inches negative pressure until I whack the throttle to 5500-6000, then it slams to positive 2"! I do have a breather on one valve cover, and a PCV on the other into the carb base/manifold vac. Do I need an evac system? Maybe stock pressure oil pump? Windage tray? Please help! I mostly see it happen under no load. The pressure may be more than 2", that's the max reading on the gauge. The point is, it spikes for some reason at the higher rpms. I just have a Mr Gasket chrome breather, on alum. valve cover with no baffles. Theres evidence of oil out the breather cap too. I guess the primary cause for pressure in the bottom end is blowby, I will have to try a leakdown test. Do I need to bother with the PCV, or maybe take it out and replace with additional breathers in the valve covers? Theres only about 9 inches vacuum at idle. As Clay said, I would hope you have more inches of vacuum at idle. The power valve will be open otherwise. It could be that the at high RPM, the WOT lets the PCV close (no vacuum, so the spring closes it). That could be the cause of the spike in pressure I saw on the gauge. Especially if the breather cap is restricted, or too small to allow the volume of pressure out. Can you recommend a good push-in breather? what oil are you running? sounds silly but sometimes the oil can screw with ring seal. ive encountered this phenomenon two times in 20 years. unlikely but it does happen. other than that.... what they said. leak down test! Theres 9"Hg manifold vacuum at idle. in the crankcase, i measured with a low pressure gauge, -2 in water column (not mercury). running 10W40 pennzoil with Lucas additive. Without baffles in a valve cover you are probably going to have oil coming out of about any breather you run. You might as well make some baffles to go inside your valve covers. I run a K & N style clamp on breather from our local speed shop. I had to take the baffles out of these valve covers but the stud girdles are pretty close to the valve covers and shield the breather outlet pretty good. I originally made this offset breather pipe to clear supercharger plumbing but it helps with oil control also. doesnt sound like anything weird with the oil. might need to ditch the pcv and run some good valve cover breathers. like Clay said... you need baffles if youre going to use them. i would still do a leakdown. The cam is pretty big ( duration) so the 9" at idle is probably about the best you are going to get. You just have to make sure the power valve is closing at idle probably a 7.5 or less. I have had engines do this before when they were new, and they got better after they had a few miles on them, like 500-2000 miles of break in. If you can I would run a 5/8" or bigger diameter hose from the breather into the base of the air cleaner. Basically a stock set up which should flow enough air to keep the dip stick in. The other thing is check to make sure the dip stick is not hitting the crank, and being knocked out because of the mechanical contact. How many miles are on this engine? The other thing is check to make sure the dip stick is not hitting the crank, and being knocked out because of the mechanical contact. How many miles are on this engine? Excellent call!! If the down tube is missing it could very well happen. If you can I would run a 5/8" or bigger diameter hose from the breather into the base of the air cleaner. 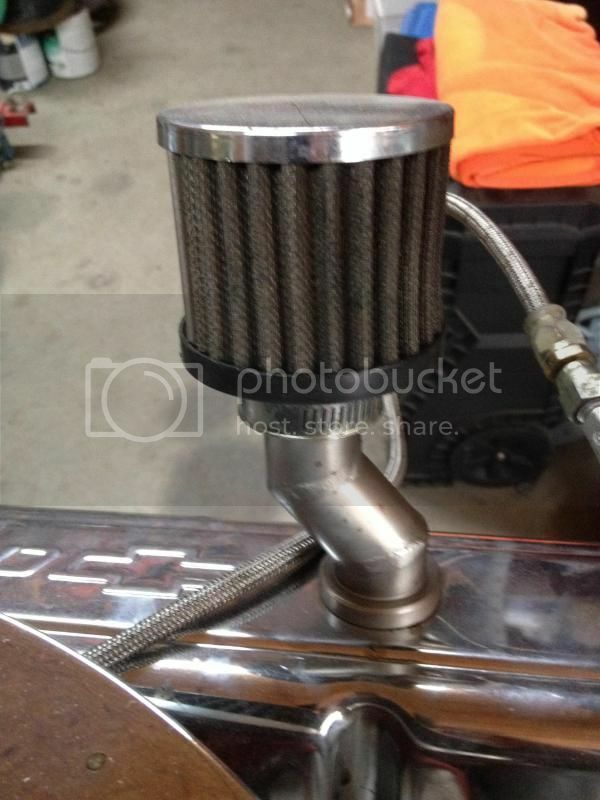 Basically a stock set up which should flow enough air to keep the dip stick in. The other thing is check to make sure the dip stick is not hitting the crank, and being knocked out because of the mechanical contact. How many miles are on this engine? This motor is basically brand new. less than 50 miles on it, but the car isn't street legal, so I can only run it at the track. It was spraying oil under the hood during burnout, when I found the dipstick pushed up about 4 inches, that's why I suspect crankcase pressure. I wasn't running an air cleaner, I can add one and try plumbing the breather to it like you suggested. I did not realize it was a track car. In that case a cheap fix would be to weld a couple pieces of pipe into the header collectors at a 45degree angle, threaded for a couple of smog tube check valves, and run a hose from each valve cover to the check valves.